Our Board of Officers would like to welcome you to a new BNC year! We are so excited kick off this year of events together. We are here to answer any questions, so don’t hesitate to reach out. Join the largest friends-of-a-library network in the world and gain access to all of our exciting events while supporting a renowned research university! To become a member of BNC San Dieguito, please join online. Be sure to check out our events calendar. 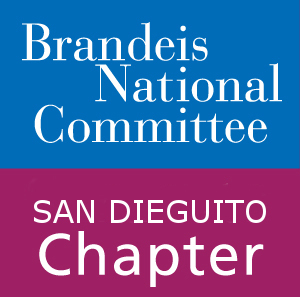 All Rights Reserved, San Dieguito Chapter of the Brandeis National Committee.